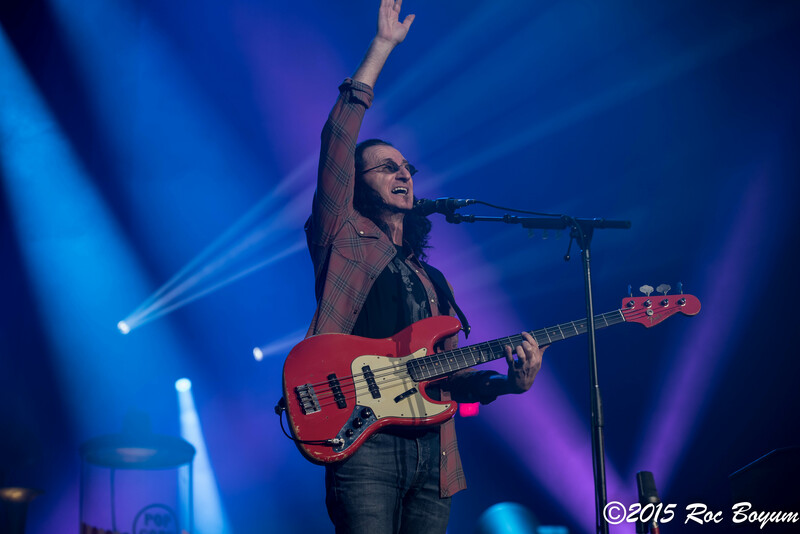 RUSH, Alex Lifeson, Geddy Lee and Neil Peart, ignite the City of Los Angeles with the final stop of their R40 tour at The Los Angeles Forum on August 1, 2015. The City of Angels came out in full force to celebrate their musical heroes and thank them for 40 years of incredible music; LA was honored to host their final show. The night began with an entertaining video of animated Rush History, before the band lit up the stage with a scorching version of the Anarchist and then plunging into a finger shredding version of Headlong Flight, which included Neil Peart’s first drum solo of the night, Drumbastia. This tour had several different set list variations and when the LA crowd witnessed Headlong Flight as the 2nd song, they knew this set order was indeed significant, and this marked the first hint the night just might have some special surprises. The band continued to blaze their way through the set with brilliant versions of Far Cry, The Main Monkey Business and One Little Victory. 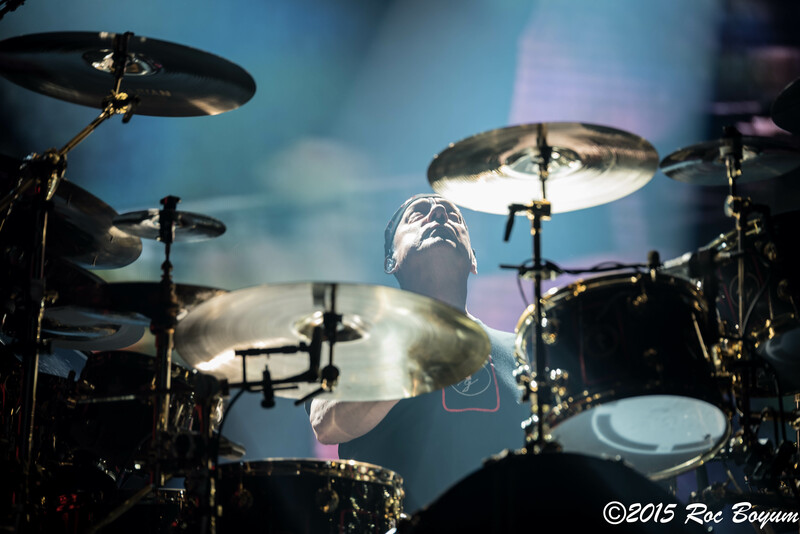 Then Peart broke into the beginning of Animate with its badass, deep and heavy groove. 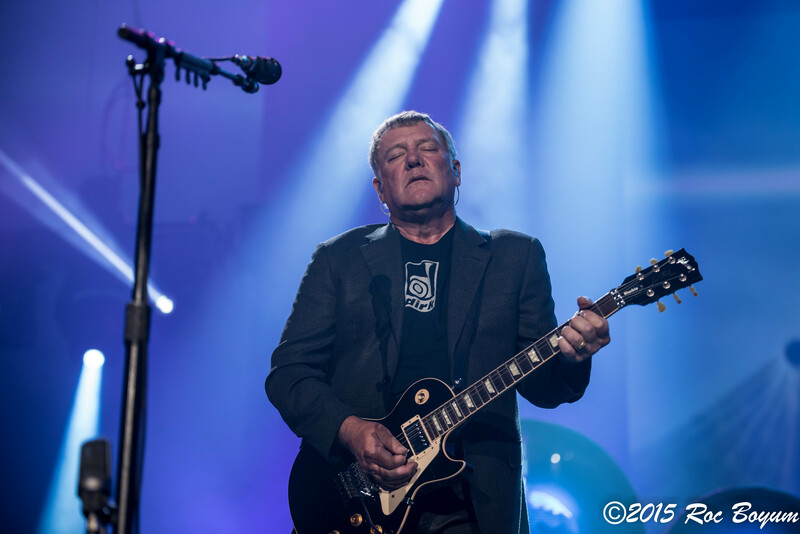 The song continued with the bridge section soaring with Lifeson’s textural guitar sounds, complemented by Lee’s vocals and Peart’s signature drums, painting the picture of African drum voices calling to each other in the night. Next, they stormed into Roll The Bones, where they replaced the famous animated skeleton rapper with a host of various stars including the Trailer Park Boys who were entertaining, funny and added a new dimension to the song which had the audience cheering. The only song represented from the Grace Under Pressure LP was Distant Early Warning, which had the Forum crowd of over 17 thousand fans pumping their fists in the air in perfect synchronicity to the song’s syncopated breaks. At this point, the crowd went crazy as Lee announced Losing It from the Signals LP. Losing it, is a ballad which features an incredible Violin solo originally performed by Ben Mink. For this show, the band brought out Jonathan Dinklage, a violinist from the Clockwork Angels tour, who shredded this ridiculously difficult solo. The entire audience witnessed his incredible chops and erupted into applause. Losing It had never been played live before this tour and was performed for the first time in Canada to be filmed for a possible LIVE DVD of the R40 tour. The Forum then echoed with manic frenzy as the set finished with a blistering version of the fan favorite Subdivisions. During the break, you could hear fans talk about past LA Forum Rush shows and how much better the acoustics seemed to be in this newly renovated building. As I walked through the concession halls, I could hear singing; “the bell tolls for thee” from the song Losing it. I also talked to a few fathers who brought their kids to this show for their first concert experience. After the first set, these kids were eager to become part of the Rush community and couldn’t wait for the next set to start. After the brief intermission, the band returned for the second set, which featured a change in the back-line of amps and drums. This tour presented a back-line of equipment that would reflect each era of music that the band was performing at that moment. 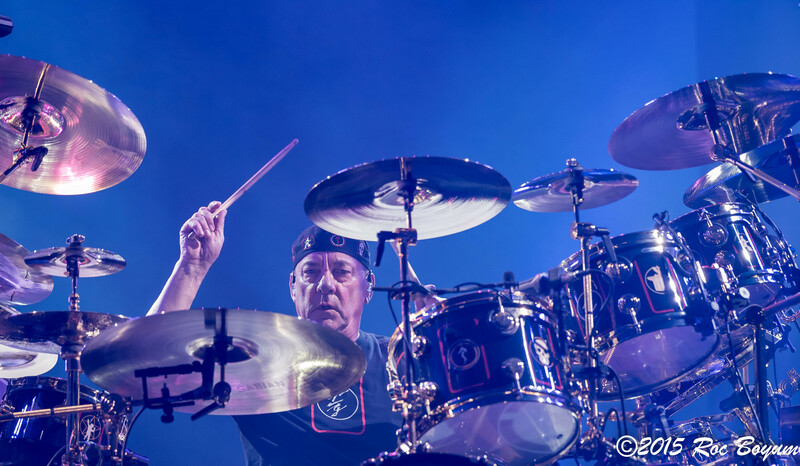 The exception to the equipment set-up change in set two, was Peart’s – “El Darko” drum kit, which remained throughout set two and the encore. The second set began with the famous South Park video animation of “Lil Rush” counting off the first song, Tom Sawyer which was followed by everyone’s favorite Red Barchetta, representing the Moving Pictures LP. The audience then sang along to The Spirit Of Radio from Permanent Waves. Then the energy and lights of the Forum transported the crowd into a Mystical Realm as Jacob’s Ladder echoed throughout the arena. 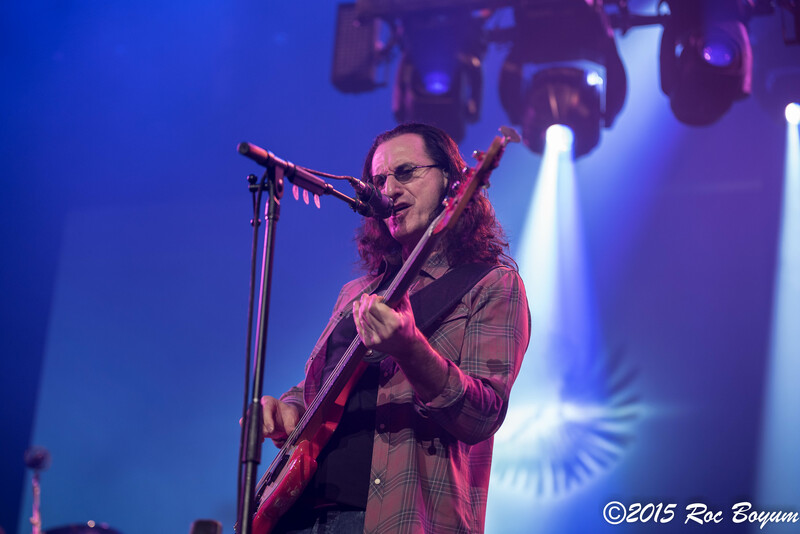 The band then continued their musical journey back in time and treated Los Angeles to a brilliant medley of Cygnus X-1 with parts of “Book One” from A Farewell To Kings and parts of “Book Two” from the Hemispheres LP. This particular collection of Book One and Two of the Cygnus X-1 story had never been played live in this combination before this tour and had their frenzied fans jumping in the isles. 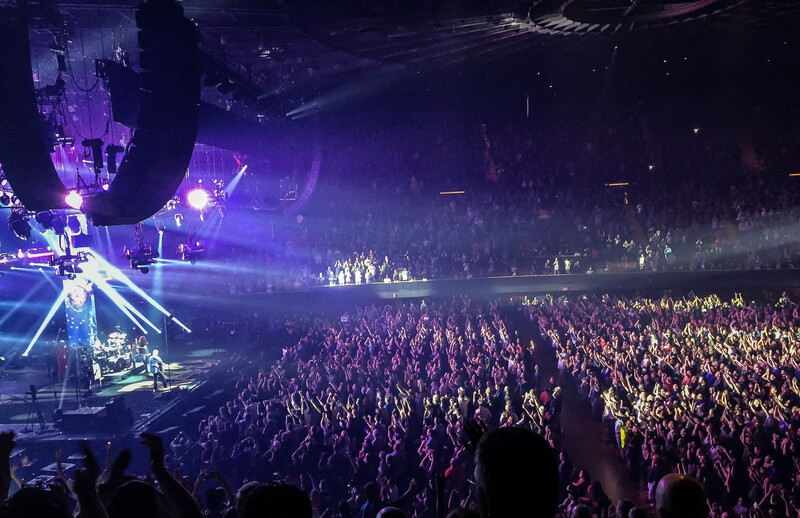 They followed with the perennial fan favorite Closer To The Heart where the Forum audience created an atmosphere with a sea of lighters, lighted cell phones and special 2112 lights waving in the air. 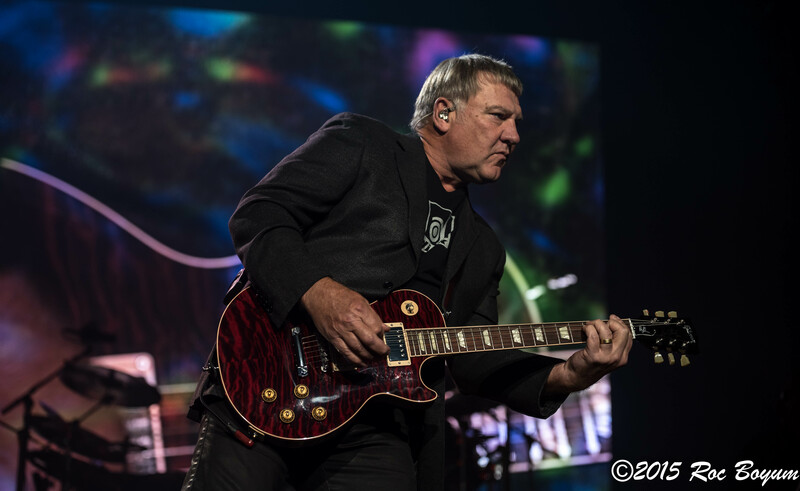 The epic Xanadu, which is another opus masterpiece, presented the crowd with Lifeson on his double neck guitar and Lee on a double neck combination of bass and guitar which created a very special live event. The second set was almost over but wouldn’t be complete without a medley of at least part of the story of 2112. For R40, Rush created the perfect blend of 2112:1 – Overture, 2112:II – Temples Of Syrinx, and 2112: IV – Presentation (with Lifeson’s fret burning solo) and 2112: VII – The Grand Finale. This was the perfect end to an absolutely brilliant set of Rush classics. The stage set-up continued to scale down and with only a few songs remaining in the encore, the stage became a set of single amps and a back drop of a basketball gym where they first started. The encore brought Lakeside Park, Anthem, What You’re Doing and Working Man with the final shredding Lifeson solo which made for an unforgettable night all of Los Angeles would forever treasure. Farewell may be on the lips of many but Rush played with the enthusiasm and precision that would make one think they’ve got many more years in the tank. At the end of the encore, Peart stood on his drum riser taking pictures of the audience and Lee offered these parting words; Thank you Los Angeles for 40 amazing years and “I do hope we meet again sometime.” The message held high on the signs from the fans in the front row thanked Rush for 40 years of incredible music and that says it all! 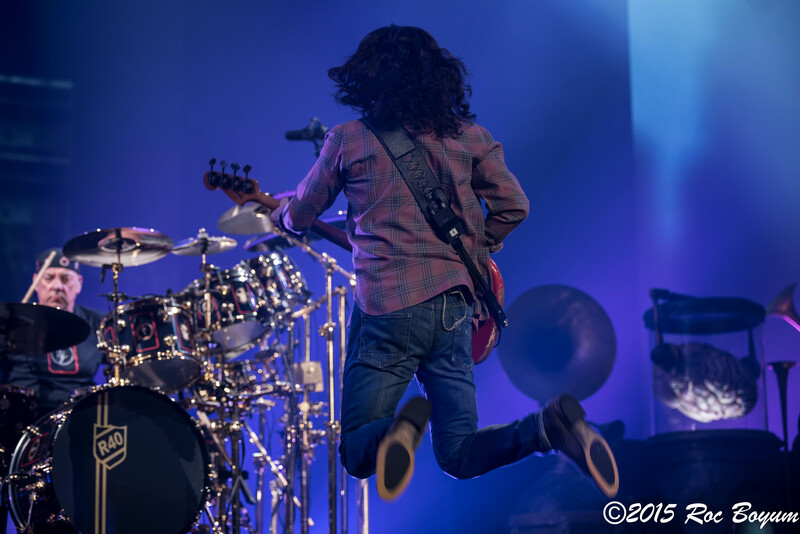 It was a night of an epic encounter with the 3 luminaries known as Rush and indeed they have inspired us all.